Already paid: More than $90 million!! The first thing you should do after your login is to check the “View Ads”-Page. The ads have different colors at Neobux and depending on the color different pay and length of stay. The payout per viewed advertisement ranges from $0.001 to $0.02. 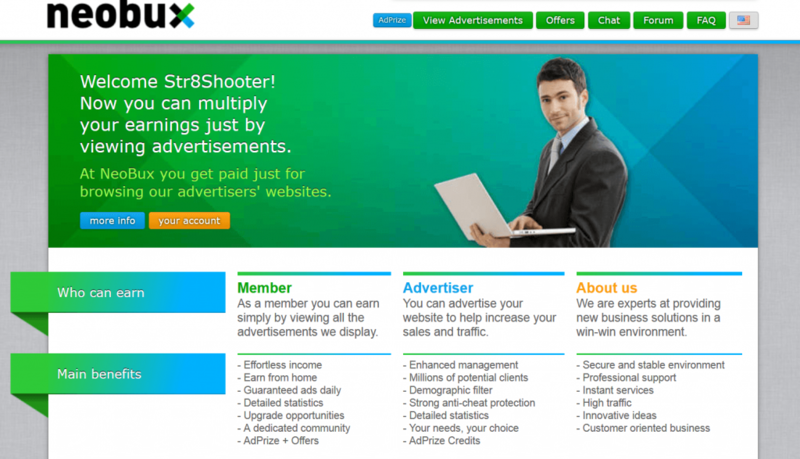 In addition to the fixed pay per click you will also receive a bonus pack consisting of 3 Adprize opportunities, 1 NeoPoint & the chance to win one of 100 cash prizes (worth $0.50 each) for every single advertisement you got paid at Neobux. You can only be credited by the same advertisement once each 24 hours. This depends on your reset time shown at the top of your “View Ads” Page. This means that after that time, another period of 24 hours will count so that you can be credited by viewing the advertisements. Your reset time is set randomly upon registration and cannot be modified under any circumstances. With a bit of luck and many Adprize clicks there are huge prizes possible. Stay tuned and be active every day, your profits will come, guaranteed! To not miss any advertisements and always be informed as soon as a new advertisement is available Neobux provides their members a browser toolbar called “Adalert”. This toolbar can be downloaded here with just a click, Safari, Chrome, FireFox, IExplorer, and Opera are supported. Tasks are small jobs like “Searching websites via Google, Bing or Yahoo…”, “Check Adress Information on Websites”, “Describing or Compare images” and so on. 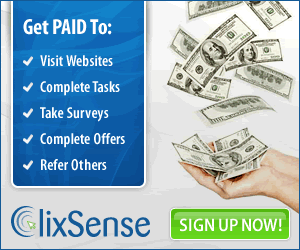 Depending on the amount of work you will be rewarded $0,01 upwards. The mini-jobs / tasks are provided by the external providers Croudflower. If you check the tab “Offers” –> “Mini Jobs” the first time at Neobux you have to register for Crowdflower with your name, eMail & password. This ensures that Neobux can match your merits of the tasks correctly and credit the dollars directly to your Neobux balance. 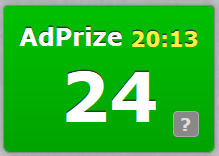 As you can see in the screenshot above, golden members significantly earn more money for clicking on ads. 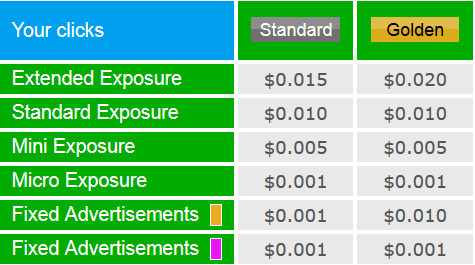 Now you have access to 9 orange-colored “Fixed Ads” with a value of $0.01 instead $0.001, which is value increase by 1000% in contrast to the value of the same ads for standard users. You also get a bonus of 24% on every dollar you earn with mini-jobs/tasks. This entry was posted in Neobux, PTC Websites by admin. Bookmark the permalink.